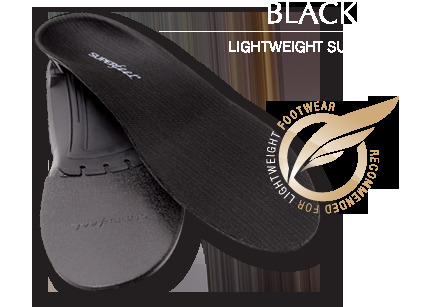 ﻿ Superfeet Premium Insoles - Black - $49.95 : Bruised Boutique, For Derby. By Derby. Premium insoles can help improve your foot comfort in your skates! Superfeet Black features a unique stabilizer cap for optimal underfoot support. When integrated with the shape and design of the foam full length, this combination creates a deep heel cup to cradle the heel’s fat pad for improved natural shock absorption. This system provides comfort and necessary stability for different activities, footwear and foot types.